There have been problems with the dumping of shark carcasses. Concern has been raised at the boat ramps at Point Roadknight and also at the Lorne pier/boat ramp. Fishing practices such as dumping shark carcasses appear to be leading to an increase in stingray numbers along these sections of beach. At Lorne in particular, there are very large Smooth Stingrays 2-3 metres long. Earlier this year a swimmer was seriously barbed by one of these animals. Many people enjoy these areas – swimmers, families, school groups, divers, boaties and surfers, to name a few. It is legal to dump carcasses. Reg. 93(1) of the Fisheries Regulations 2009 requires that a person must not, in or on Victorian waters, possess shark or elephant fish in any form other than whole or carcass. This regulation is in place to ensure size limits are adhered to. There is no offence under Victorian Fisheries Regulations for discarding a shark carcass into the water following landing a catch at a boat ramp. Fisheries Victoria and GORCC would, however, like to encourage fishers to take a carcass home and bury it, give it to the dog, or compost it. Members of the community may like to do likewise if they see a carcass in these areas. Keeping a large plastic bag in the car would be helpful as well. (Thanks to Regina from Eco-logic for this article). The swans at Allen Noble Sanctuary in Aireys Inlet have five cygnets. This small wetland has been an excellent nursery for the resident swans and over the years they have successfully raised a number of young. It appears that the present cygnets hatched sometime early in July, which is quite early in the season. While we were walking along the beach between The Gulch and O’Donohue car park following a Friends of Eastern Otways weeding session, we noticed a small flock of Hooded Plovers flying low over the water until they settled on the beach a little way from us. Also seven Hooded Plovers were seen at Thirteenth Beach, near Barwon Heads. Family parties and small flocks are common during autumn and winter, before pairing off for the breeding season which begins about September. There has been a very unusual reporting of a Scarlet Honeyeater at Moggs Creek. It was described as brown-plumaged, which means it was a female, but the range of Scarlet Honeyeaters does not include this area. Of course from time to time there are vagrants found in unlikely places. 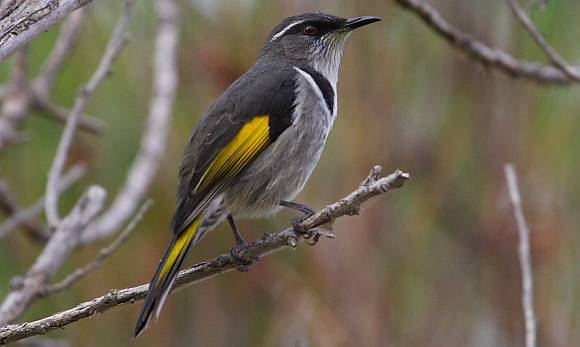 Scarlet Honeyeaters are found in north-eastern Australia, especially coastal forest areas. On occasions summer migrants make it to Victoria and the Gippsland Lakes region. The eucalypts in flower at Distillery Creek are certainly an attraction for Crescent Honeyeaters. Over 200 were seen at Moggs Creek picnic ground by a birdwatcher who observed them last month. I walked along the nature trail at Distillery Creek in mid-August, on a sunny day, and they were everywhere and calling constantly. I also watched a Silvereye feeding on the flowers of the Hazel Pomaderris. Whales sightings are still being recorded from around Lorne area at Loutitt Bay and in North Lorne, out from Stoney Creek, as well as further along towards Warrnambool. The identified ones have all been Southern Right Whales.